When I’m writing a GUI or a multithreaded server application, I make heavy use of OutputDebugString (and various API’s that map to it). This is a very useful tool when the act of stepping through an application has side effects that drastically change the experiment. Unfortunately, it looks everyone else likes this API, too. I try to be courteous and pay my developer taxes here—when my application is deployed to customers, rest assured that it will not be writing debugger output by default. 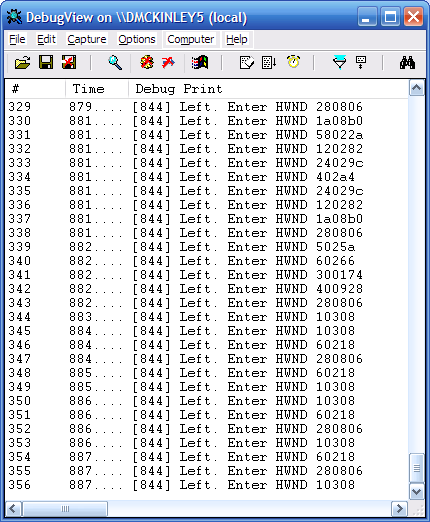 I put my calls to OutputDebugString on a switch in one way or another, or I just compile them out in release mode. Visual Studio 2005 [by far the worst]. Visual SourceSafe [a close second place]. The remnants of Symantec products that I have not yet succeeded in disabling. I find it particularly annoying that my development tools are hampering my development in this way.